The BoVine Brasserie in St Ives is new, opening in June 2015. It is a restaurant that serves meat. Grilled steaks, ribs and high end burgers. BoVine says it “brings an elegant steakhouse dining experience to Sydney’s Upper North Shore” and it does it very well. BoVine is a Brasserie/Grill that will appeal to families, particularly those with older children (late teen, young adults) as there is a good range of casual eating options which are good to eat and exciting to look at. Located in the small shopping complex opposite Hassel Park, the location is home to Road to Goa Indian restaurant and the Bellini’s, the Italian family favourite so the area sees a good numbers of people coming to the location. Grilled Haloumi. Served with Arugula and artichoke tapenade. The BoVine menu includes a wide variety of choices, including fish, chicken, lamb chops and burgers. There are vegetarian and gluten free options available and with many sauces, sides and options, even the fussiest pallet will be satisfied. There is an extensive wine list with most wines available by the bottle or glass. The wine list is naturally weighted towards reds, but there is a good choice of whites as well. But the star of the evening is beef. The beef is sourced from Tasmania or Victoria, depending on the cut and includes rib eye, rump, T-bone, fillet and New York cut options. Tonight I am having the Bo Vine Scotch fillet ($39). Scotch Fillet. MSA4 Pasture fed from Cape Grim in Tasmania. The Scotch fillet has been pasture fed and comes from Cape Grim in Tasmania with an MSA4 grading. MSA grading comes from Meat Standards Australia and denotes the quality of marbling of the meat. Lots of information can be found here and MSA4 means the meat has high quality intramuscular fat and that means juicy and tasty when cooked on a grill. My steak is cooked medium to rare, so it is pink inside but dark and tasty outside. 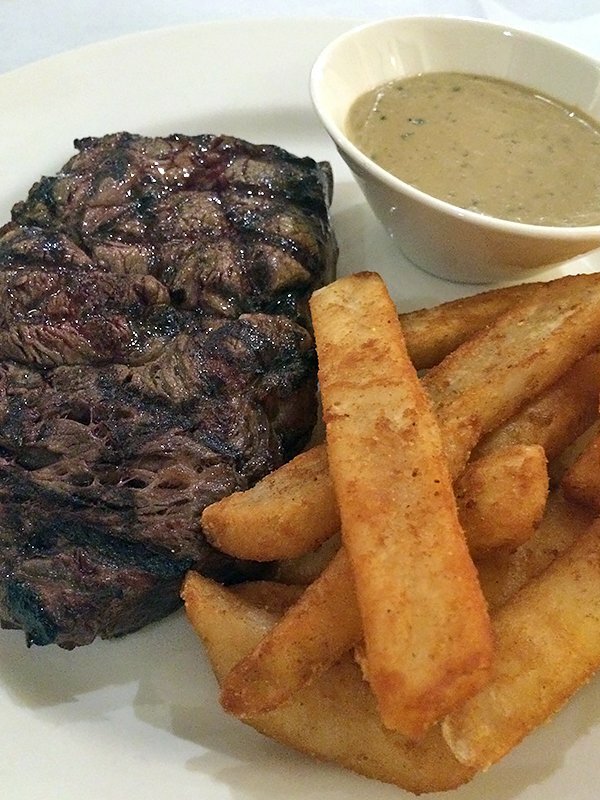 A good, strong beef flavour which goes perfectly with their sauces – green peppercorn, béarnaise, mushroom or red wine. But don’t bother with their sauces, choose a vinegar instead. Yes, vinegar. There is a choice of sweet black cherry, blood plum or spiced beetroot. These are wonderful accompaniments to the beef. The sweet black cherry is my pick of the trio which was national champion at the 2006 Sydney Royal Show. My steak comes with big fat beer battered crispy chips. I could have had a baked potato, but my willpower is weak. I also have some asparagus with lemon and olive oil as an accompaniment which is perfectly cooked. 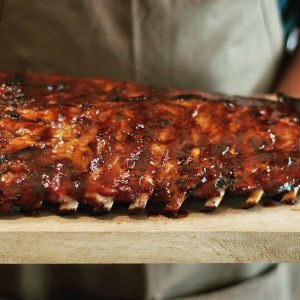 BoVine Pork Ribs. Cooked sous verde and flame grilled, finished with Bo Vine’s special sauce. 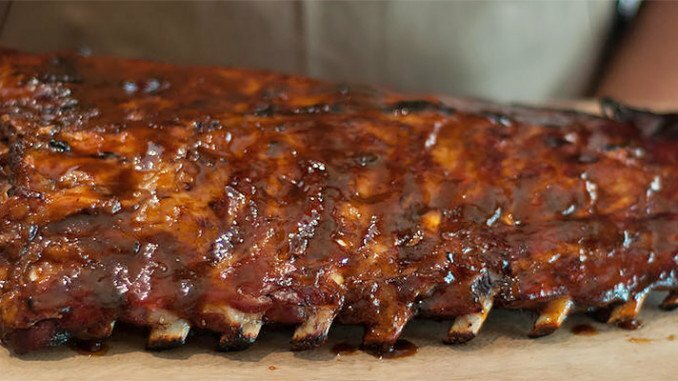 When I return, and I will return, I will have the rack of ribs. It is magnificent! The full rack of pork ribs is huge and really, really good looking ($49). Cooked sous vide and then finished on a flame grill with the Bo Vine special sauce, I suspect this is going to become their signature dish. Expect to pay around $50/head plus wine for the steaks and main meals and around $20/head for burgers. On the downside, I found the restaurant a little noisy, which could be easily fixed with some sound dampeners on the wall. The staff were helpful and attentive but the lady that served us seemed a little under-confident about her product. She was quick and pleasant, was very good at selling the options and extras on the menu, but was stumped with some questions about the menu (if the menu says MSA4 Pasture Fed, then she should know what that means). That will change quickly as she learns the menu and realises she is good at what she does. As this is primarily a steak restaurant, I would like the wine list to have a couple more cabernet sauvignon options with at least one or two from the Barossa in South Australia. Looking at the white wines, there is a good opportunity to stock a few more local wines such as a Hunter Valley Semillon and perhaps a local champagne. Locals like local produce. What I really liked, as I ate my meal the head chef/owner appeared in the restaurant. He came out to make sure the steaks were cooked the way we liked them and to have a chat. That’s important to me. I like to see the chef and it gives them great feedback about what is happening in the front of house. Bo Vine is a good addition to the restaurant landscape in St Ives. Well worth the visit.